Stephen Hawking passed away today at the age of 76. I share this 2007 post to remember him. 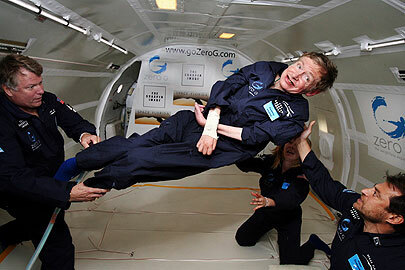 Stephen has suffered for many many years from Amyotrophic Lateral Sclerosis (Lou Gehrig's disease). This flight was the first time in 40 years that Stephen moved freely beyond his wheelchair. Lou Gehrig's disease is so hard it's a cool thing to see someone get to enjoy this. My aunt is now able to move freely from this disease with God. I bet he is no longer an atheist! "No one created the universe and no one directs our fate." The sentence is so revealing. I can really understand why someone who suffered so long with ALS could not envision an entity who directed his fate. The sentiment also uncovers how unimaginative his view of God was. Many seem to embrace a similar view that sees God as the manipulator of atoms and an entity that stands by as folks suffer for years. I am not one of those folks. I think that divine sovereignty is different than most think. Here is how I think God interacts with the world. The existence of one form of sovereignty does not negate the other. In the end, God is more about influencing us and not controlling us.